Batik (là rǎn 蜡染) is a wax-resist dyeing technique used on textile. Chinese Batik is also called La Ran (là rǎn 蜡染) in China. 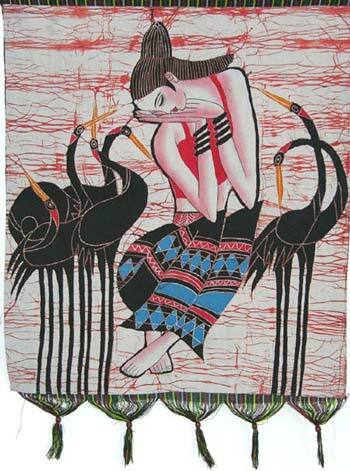 Researches show batik originates from ancient China. It was then called La Xie (là xié 腊缬). As early as in Qin (qín cháo 秦朝) and Han Dynasties (hàn cháo汉朝), people in southwestern minority regions of China, finding that wax can prevent from dyeing(rǎn 染), proficiently mastered the craft of batik. They used bees wax (là 蜡) and worm wax as material in preventing dyeing. 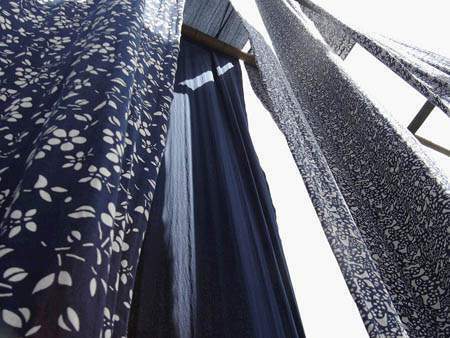 The blue calico (lán yìn huā bù 蓝印花布) is a kind of traditional printed-dyed handicraft in the south area of the Yangtze River with a long history that can be traced back to Qin (qín 秦) and Han (hàn 汉) Dynasties. Ancient Chinese bridges (zhōng guó gǔ dài qiáo liáng 中国古代桥梁) are universally acknowledged and have enjoyed high prestige in the bridge history of both the East and the West. 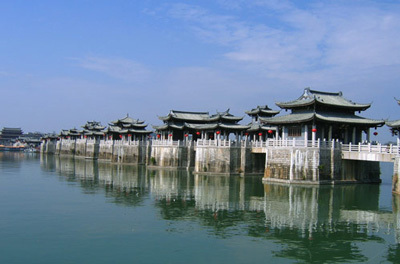 Throughout history, the Chinese nation has erected thousands of ingeniously designed and magnificent bridges. Crossing over mountains, spanning rivers, they have facilitated transportation, beautified landscapes and have become one of the marks of ancient Chinese civilization. China is the earliest country to have produced silk (sī chóu 丝绸). 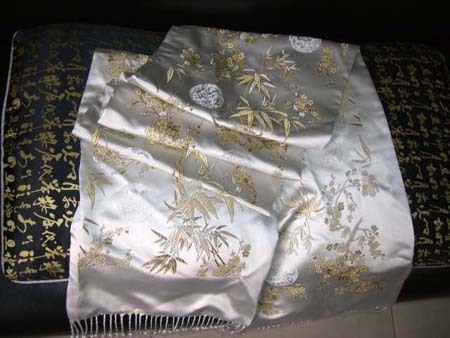 Silk is a symbol of the ancient culture of China. Legend has it that Lei Zu (léi zǔ 嫘祖), wife of Emperor Huangdi (huáng dì 黄帝), invented sericulture (yǎng cán 养蚕), silk reeling (sāo sī 缫丝) and weaving. Chinese archaeologists believe the technology of silk weaving has at least a history of more than 4000 years. 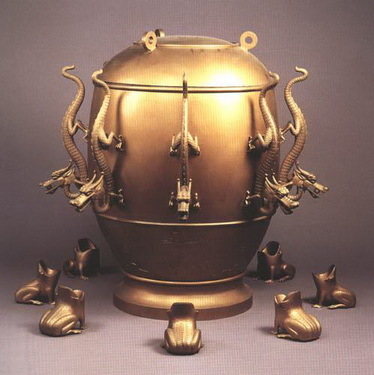 The first seismograph (dì dǒng yí 地动仪) of the world was invented by Zhang Heng (zhāng héng 张衡), a famous scientist in the Eastern Han Dynasty (dōng hàn 东汉, 25-220). Zhang Heng (78-139) was from Nanyang (nán yáng 南阳) in Henan Province (hé nán shěng 河南省). He studied diligently, and was especially keen on astronomy, calendars and mathematics. As a whole, Zhang Heng can be regarded as an erudite and talented scientist. There were a great varieties of lamps in ancient China, oil-burning lamps were a common means of night-time illumination in this and later periods. The Changxin Palace Lamp (cháng xìn gōng dēng 长信宫灯) of the Han Dynasty ( hàncháo 汉朝) (208BC—220AD) is a veritable treasure. 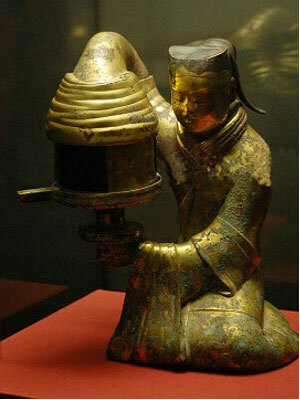 The Changxin Palace Lamp is made of bronze and is gold coated (líu jīn 鎏金). Textual research shows this lantern was used by the mother of Emperor Jingdi (jǐngdì 景帝) (156-140BC).The lantern has an ingenious design and as a whole, it is the shape of a maid of honor on her knees holding a lantern. The lamp she holds is pivoted so that light could be directed as her mistress might wish. Smoke from the candle within passes up through the girl's sleeve and on into the hollow body, so no soot would dirty the room. The lamp holder can store water, dissolving soot from the smoke. Now it is in the collection of the Museum of Hebei Province (héběi 河北), China.